Biomass is a term referring to all organic matter that has stored energy through the process of photosynthesis, the process used by plants and other organisms to convert light energy from the sun into chemical energy that can be later released to fuel the organism’s activities and functions. Since plants live and grow they are, by definition, a renewable resource. Biomass is one of the most plentiful sources of renewable energy in the world. In the past two decades it has been second only to the use of hydropower in the generation of electricity. Biomass is such a widely utilized source of energy because of its low cost and indigenous nature. It accounts for almost 15% of the world's total energy supply and as much as 35% in developing countries. It is most generally used for cooking and heating. Biofuels are energy sources made from living things, or the waste that living things produce. The conversion of biomass to biofuel can be achieved by 4 different broadly classified methods: thermal, thermochemical, chemical, and biochemical methods. Thermal - The use of heat, with or without the presence of oxygen, to convert biomass materials or feedstocks into other forms of energy. Thermal conversion technologies include direct combustion, pyrolysis, and torrefaction. Direct combustion is the burning of biomass in the presence of oxygen. In a furnace, biomass burns in a combustion chamber converting the biomass into heat. The heat is distributed in the form of hot air or water. In a boiler, the heat of combustion is converted into steam. Steam can be used to produce electricity, mechanical energy, or heating and cooling. Pyrolysis and torrefaction produce useful energy under controlled temperature and oxygen conditions and are used to convert biomass feedstocks into gas, oil or forms of charcoal. These energy products are more energy dense than the original biomass. Pyrolysis is a processes of subjecting a biomass feedstock to high temperatures (greater than 430 °C) under pressurized environments and at low oxygen levels. Torrefaction, like pyrolysis, is the conversion of biomass with the application of heat in the absence of oxygen, but at lower temperatures than those typically used in pyrolysis. In torrefaction temperatures typically range between 200-320 °C. Thermochemical - The application of heat and chemical processes in the production of energy products from biomass. A key thermochemical conversion process if gasification. 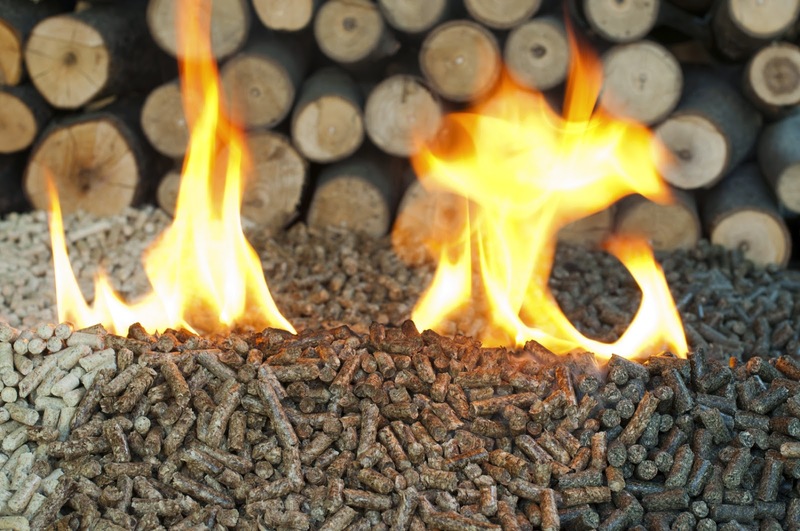 Gasification is the use of high temperatures and a controlled environment that leads to nearly all of the biomass being converted into gas. This takes place in two stages: partial combustion to form gas and charcoal, followed by chemical reduction. Chemical - Involves use of chemical agents to convert biomass into liquid fuels. Chemical conversion of biomass involves use of chemical interactions to transform biomass into other forms of useable energy. Biochemical - Involves use of enzymes, bacteria or other microorganisms to break down biomass into liquid fuels, and includes anaerobic digestion, and fermentation. Anaerobic digestion is the use of microorganisms in oxygen-free environments to break down organic material. Anaerobic digestion is widely used for the production of methane- and carbon-rich biogas from crop residues, food scraps, and manure (human and animal). Anaerobic digestion is frequently used in the treatment of wastewater and to reduce emissions from landfills. Fermentation is the use of yeasts to convert carbohydrates into alcohol, including ethanol, which is also called bioethanol. Biomass residuals are left after municipal solid waste (MSW) has been processed through a materials recovery facility (MRF) and all recyclables have been recovered. This type of system requires sophisticated technologies and is an innovative way to responsibly deal with landfill waste. For more information on renewable energy sources visit www.wasteawaygroup.com.